Next to your refrigerator, your dryer is likely the biggest energy-guzzling appliance in your house. And while we wouldn't ask you to store your food in a vintage icebox, an old-fashioned clothesline is actually a pretty good idea. You can buy a pulley kit like the one pictured here at the hardware store. Or you can order the components online. But it's easy to make a traditional clothesline yourself, using 4x4 or 6x6 pressure-treated posts for the uprights and 2x8s for the cross-arms (which don't need to be pressure-treated). Simply notch the posts to receive the cross-arms, set them in concrete, and run the lines on eye hooks between them. A 4- or 5-foot cross-arm should give you enough room for five lengths of line, nicely spaced. There's at least one place in your house—a dark stairwell, a north-facing bathroom, a rear hallway—where you can't see what you're doing without turning on a light, even in the daytime. That's the ideal spot for a light tube, which lets you bring in the sun's rays without the hassle or expense of installing a conventional skylight. True, you don't get a sky view, but you also don't have the energy loss associated with standard roof windows. Tubular skylights are much easier to install, because the tubing fits between roof rafters and frees you from having to build a shaft to get the light through the attic. If you're handy, it's a half-day project. And if you're not, you can hire a pro and still come in under the $500 cap. As you stand around waiting for hot water to arrive at your bathroom sink—or worse, wander off to do something else while the tap is running—watch what's flowing down the drain: not just water, but all the energy that went into heating it. But let's say you could press a button and have hot water in an instant. That's the work of a clever device called an on-demand recirculating pump. Installed under the sink, the pump captures the not-yet-hot water before it exits the tap and shoots it back to the water heater. The process repeats until the water gets hot enough, at which point the pump shuts off, you turn on the tap, and the steamy stuff flows. Obviously, this setup saves water. Less intuitively, it also saves energy. That's because the water going back to the heater is usually slightly warm, so reheating it takes less energy. And the pump moves water faster than a typical faucet can, which means less heat loss in the pipes—and less waiting time for you. Without insulation, your house's hot-water pipes act as a gigantic radiator, transferring heat to the air so efficiently that any water in the pipes—even if it left the boiler at a toasty 105 degrees—is barely lukewarm 15 minutes later. So if you wash your hands to prep dinner, then need to rinse a pot, you'll have to wait for hot water all over again. The solution: Insulate pipes wherever you can reach them by encasing them in rubber or polyethylene foam tubes. The tubes come with an adhesive-coated slit down the middle, so you just ease them over the pipe and press the ends closed. Seal the seams with duct tape. Tests show that insulation can double the cool-down time in 1/2-inch pipe and triple it in 3/4-inch pipe. Plant trees now on the south, east, and west sides of your house, and you can picnic under them in a couple of years. In five years, they may provide enough shade to let you run your air conditioner less frequently. And when the trees mature, they could save you as much as 40 percent on your cooling costs. Beyond shading your property, trees also help combat the "heat island" effect that occurs in urban areas, where concrete and asphalt absorb and hold in heat. 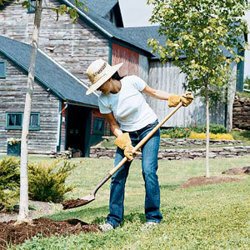 Two popular varieties are red oak for large lots (it grows to 70 feet) and trident maple for small ones. But before you buy any saplings, check with your city's public works department; some trees have invasive roots that plug water or sewer lines. With an estimated annual savings of $100 and an initial outlay of only about $50, few upgrades pay for themselves as quickly as this one can. With a programmable thermostat, you can automatically adjust your heating and air-conditioning systems to match your family's seven-day schedule. During the winter, for example, you can set it to turn off the heat after everyone's snug in bed, switch it back on in time for a warm wake-up, then putter along at a lower temp until the kids get home from school. The most advanced models let you program up to four settings for each day of the week. For every degree you lower your thermostat for an 8-hour period, you cut energy use by about 1 percent. Set it back 10 degrees overnight, and that's a 10 percent savings right there. And we bet you won't even feel the difference—except when you're paying the bills. For most people, runoff is a problem. With a rain garden, it becomes an amenity. Instead of diverting your gutter water into a storm drain, where it picks up motor oil and other urban crud, you can channel it into a low spot on your property planted with bushes, grasses, or trees that like getting their feet wet. Your reward is something beautiful to look at, plus the satisfaction of knowing that you're helping to provide the natural flood control and water conservation that used to be the job of forests and wetlands. Find construction details at raingardens.org. For plant recommendations, contact your local extension office or conservation district, or your state's native plant society. In theory, a ceiling fan saves energy because the breeze evaporates moisture on your hot, sticky skin, cooling you down without the benefit of air-conditioning. In practice, though, it doesn't always work that way. People keep fans running with the AC going full blast, or leave them on when no one is in the room, which wastes their cooling power. Here's what to do instead. First, make sure any fan you buy is Energy Star rated. Energy Star fan/iight combination units use fluorescent bulbs instead of hot-burning incandescents or halogens and are up to 50 percent more efficient than standard models. Second, once the fan is installed, raise your air conditioner setting by 5 degrees. (Experiment with your heater setting, too. You may be able to lower it a degree or two if you run the fan backward so it pushes rising warm air down.) And finally, install an occupancy sensor switch that shuts the fan off if no one's in the room. From a design perspective, recessed fixtures are great, because they brighten a room without cluttering the ceiling. But from an energy efficiency perspective, they're duds. Because these fixtures usually aren't sealed and can't have insulation above them, they allow heated air to escape into the attic. You can replace them with newer, airtight models, but that can get expensive. There's a far easier fix: Buy a retrofit kit that screws into the existing fixture. The best kind seals around the rim and behind the bulb, converting your old fixture to one that is airtight and insulation-rated. You'll need a special fluorescent bulb (4 pins, 20 watts), but given the average expected life of 10,000 hours, you won't have to buy a replacement anytime soon. Let worms eat your garbage, and they'll reward you by producing rich compost for your garden. Because worms thrive in a closed container, a worm bin is much less likely to attract pests than an open compost pile. You can buy plastic worm bins, but it's a lot better to make your own, which you can easily do with one and a half sheets of exterior-grade plywood, a few scraps of 2x6, two hinges, and a handful of nails or screws. Line the bottom with bedding of moist leaves or shredded cardboard, add a colony of worms, and faithfully feed them your food scraps. Within a year you can start harvesting compost. Earthworms don't do well in confined quarters, so use red wiggler worms instead; order them online from Yelm Earthworm & Castings Farm. Improvements so easy, you have no excuse not to make them. These screw-on mesh screens break up water drop­lets so you use less water but get just as much rinsing power. If they're coated with dust, refrigerator coils can't transfer heat efficiently, so it takes more energy to cool your food. Get at them (they're usually found underneath the unit or at the back) with a long-handled brush. Over time, the seals around windows and doors wear out, letting in chill winter air and prompting you to crank up the thermostat. Put a motion sensor on your all-night garage floodlight. Not only will you save electricity; you will get to enjoy one of early fall's greatest pleasures: a clear view of the night sky. You don't need dozens of toxic products. Soap, baking soda, and vinegar or lemon juice can take care of most household cleaning needs. For recipes, get the book Clean and Green, by Annie Berthold-Bond. To compare the contents of common household cleaners, check out the Household Products Database.